When a bathtub has seen better days, most people think replacing it is the best option, but when other factors are added, your thoughts about replacement might change. First of all, the cost of the new bathtub is only the beginning. A very basic 5-foot enameled steel tub might cost less than $150, but when you add the cost of a contractor, demolition, removal, landfill fees, tilers, and a plumber, and the total cost of the job skyrockets. Alternatively, relining a tub with an acrylic liner is pricey, and it merely covers up the problem. At prices equal to or greater than refinishing, bathtub liners are not the bargain option. However, they are always cheaper than a full replacement, and unlike refinishing, you never worry about the finish wearing away. But compared to replacement and relining, refinishing your tub starts to look pretty good. Perhaps the best thing about refinishing a tub is that your tub stays in place. With home remodeling, when you change one thing, something adjacent is affected. It's the domino effect, so it stands to reason that if you can keep your bathtub in place to refinish it, you will not experience this awful, chaotic, cascading effect of tile surround, flooring, cement board, plumbing fixtures, and possibly even more, being messed up and in need of repair. When you have a tub refinished by professionals, or you recoat the tub yourself, all the work is done on-site. Surrounding materials including tile, flooring, and all of the other elements are masked off and left in place. Professional tub refinishers may call their process reglazing, and the specific steps they use may differ somewhat, but the basic process is more or less standard. Clean the bathtub thoroughly and remove all caulking. Mask around the bathtub and cover areas not to be refinished. Refinishing technicians are highly aware of the fact that they are in a private residence, so they take precautions to minimize overspray and other mess. Technicians put down drop cloths and covers over cabinets and plumbing fixtures. Remove the bath faucet, drain fittings, and other hardware. Set up a ventilation fan to vent overspray and odor outside. Lightly sand the entire bathtub to roughen the original finish. In some cases, the tub may also be etched with acid to help the new coating adhere. Vacuum the bathtub to remove debris from the sanding stage. Fill chipped, scratched, or worn areas, then sand smooth. If there is extensive damage, the restorer may charge nominal extra fees for this. Apply up to three coats of primer with a sprayer, and let it dry. Apply three or four layers of a top-coat mixture with a sprayer, and let it cure. Buff the coating, as applicable. Some bathtub refinishers come back a few days later for a final buffing; other use processes that do not require buffing. 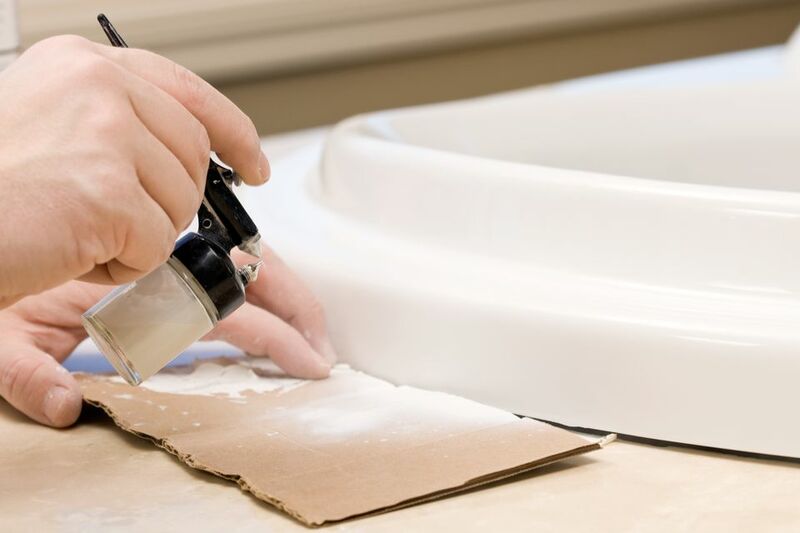 Do-it-yourself bathtub refinishing is even more inexpensive than hiring the pros, but you will end up with an inferior finish that is more likely to peel. Instead of using a spray gun, use a brush or small roller. ​You can buy DIY kits that include a quart of epoxy with hardener, latex gloves, steel wool, brush, cleaning solution, cleaner/thinner, and safety goggles. The epoxy comes in white but can be tinted (tint not included). A DIY coating is much tougher than ordinary paint but is not as durable as a professionally applied coating. To protect the finish, do not clean the recoated tub with any abrasive cleaners, such as Comet. Clean the tub thoroughly, and remove all caulking. Remove the tub faucet and drain hardware, as applicable. Mask off and cover the area around the tub, and open windows and/or set up fans to provide active ventilation of the work area. Etch the surface of the tub with water and the kit's etching powder to dull the finish so the new coating will bond to it. Rinse the tub. Sand the tub while it is still wet to further roughen it, to improve bonding. Rinse the tub and let it dry. Wipe the tub with paper towels to be sure all water is removed, then wipe with a dry tack cloth to remove any dust or paper residue. Apply the primer with a roller, and let it dry as directed. Mix the epoxy coating. Begin applying it to the sides of the tub with a roller. Alternate between vertical and horizontal strokes to prevent drips and roller ridges. Move on to the tub deck (horizontal surfaces), then roll the tub bottom. Finish the edges as needed with a sponge brush. Apply a second coat of epoxy coating immediately after the first. Let the tub cure for 48 hours, keeping the area ventilated for at least the first day. Reinstall the faucet and hardware. Caulk the tub and let it cure overnight before using the tub.